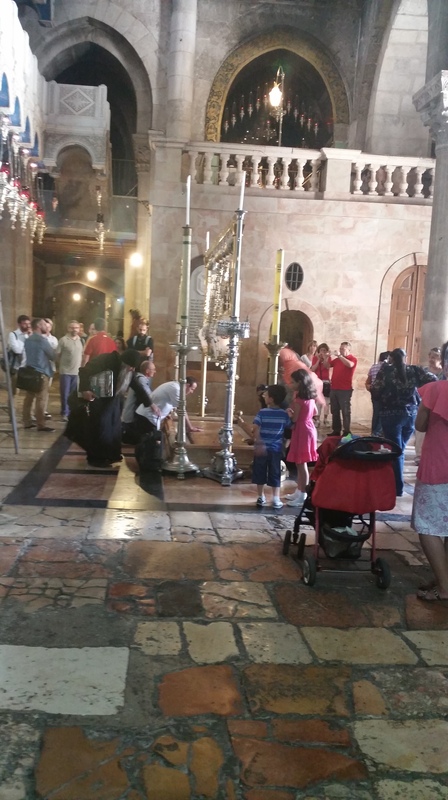 The Church of the Holy Sepulchre is a church built over Golgotha (the rock where Jesus was crucified) and the tomb of resurrection. 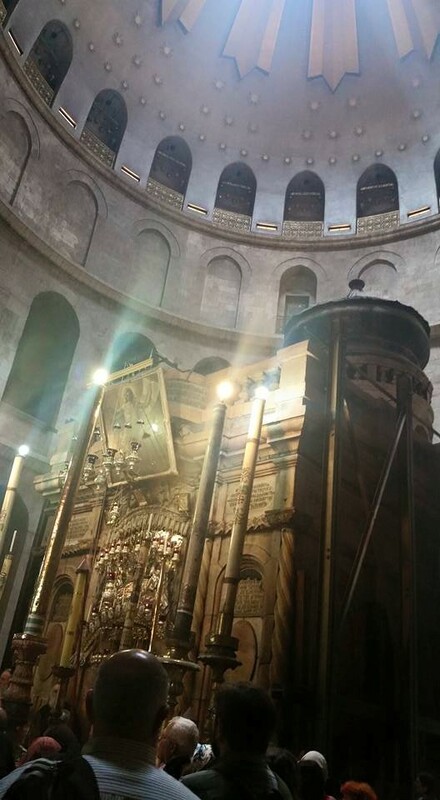 It is located in the heart of the Christian Quarter of the Old City of Jerusalem. 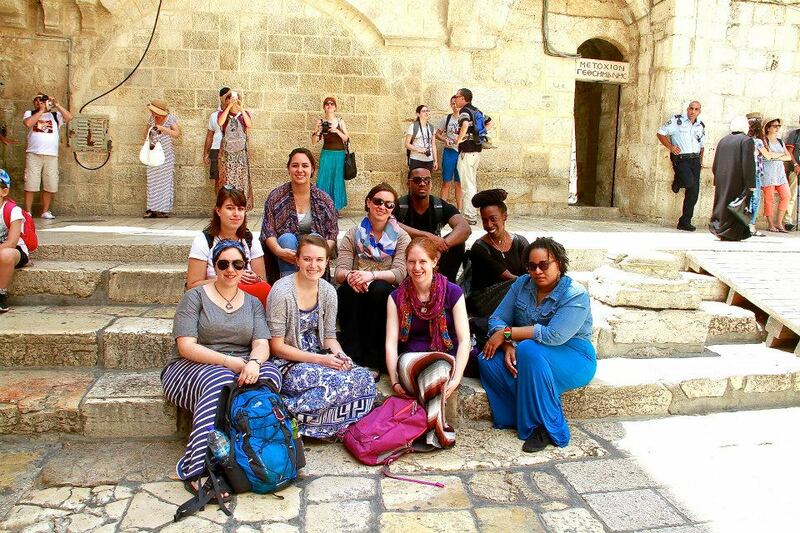 The Metro Chicago trip group outside of the Church of the Holy Sepulchre, Sunday morning, May 31. Photo on Erin Wesley’s camera by another nice visitor. 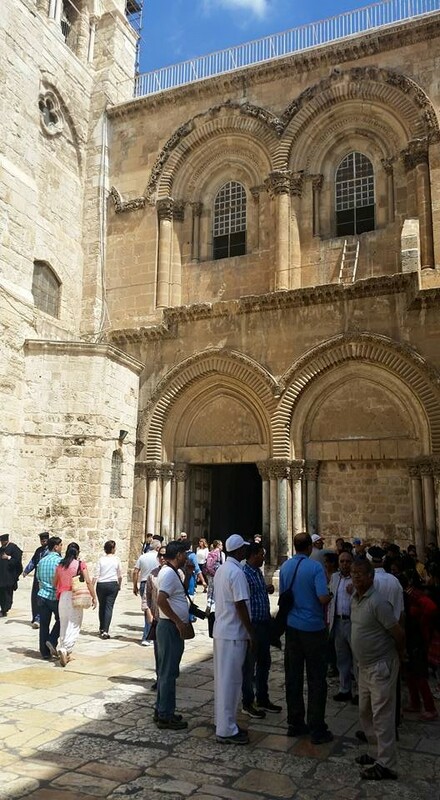 Entrance to the Church of the Holy Sepulchre. Photo by author. Upon entering this church, I noticed the smells of incense and old-ness, the sound of orthodox priests singing at the tomb (which I drew closer to later), the candle-lights everywhere. 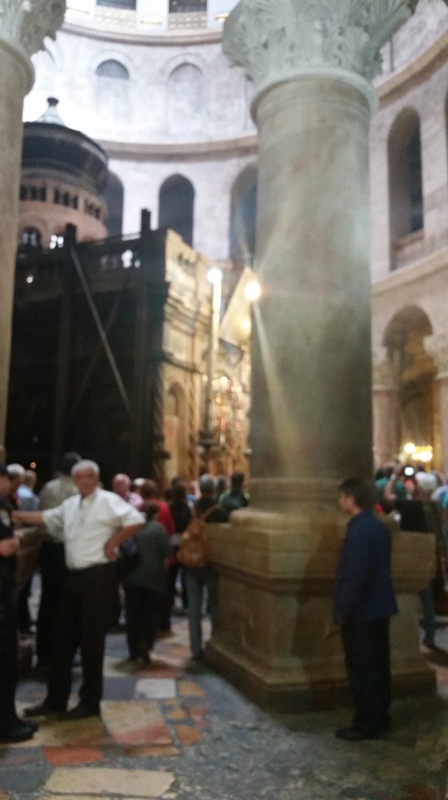 I climbed the stairs up to Golgotha and waited my turn in line to touch the rock upon which Jesus was crucified. I wandered around the main sanctuary, noticing the tourists, the fellow Christians, the security staff. I kept being drawn back to the slab, the Stone of the Anointing, that is the first thing you see when you enter the entrance pictured above. I noticed the people around it, laying their rosaries on it, reverencing it by kissing it or touching it. I kept noticing this stone. And all I could think about was the body of Michael Brown, lying in the streets of Ferguson for hours. Michael Brown. A young “thug,” he’s been called. A young criminal who’s crime was stealing from a convenience store. (Raise your hand if you’ve ever stolen or know someone who’s stolen something from a convenience store. Mine’s raised.) A young man with potential. Crucified by a sinful, systemic racism and socio-economic divide that prevents us from seeing the face of God in one another. I felt pretty devastated in that moment. And I wanted to hang on to the suffering. To make sure I understood as best as I could. To not let it go unnoticed, unfelt. It has to make a difference in my life, I thought. I looked at the crowds reverencing the stone and felt angry. Where was the reverence for Michael Brown’s body in the hours it lay on the street? Where is the reverence for the bodies of black men and women today? I wanted to scream. And then, this might sound weird, but I also heard a voice inside of me. Turn toward resurrection, it whispered. Remember Easter. And the suffering and the resurrection was there at the same time. That didn’t mean that the suffering went away. It just meant that the resurrection was there, too. And I remembered my call, why I want to do justice work. Because I know that new life is possible. This entry was posted in Metro-Chicago Trip by pnw2014. Bookmark the permalink. Powerful statement to turn toward resurrection – thanks for sharing and for working for justice.